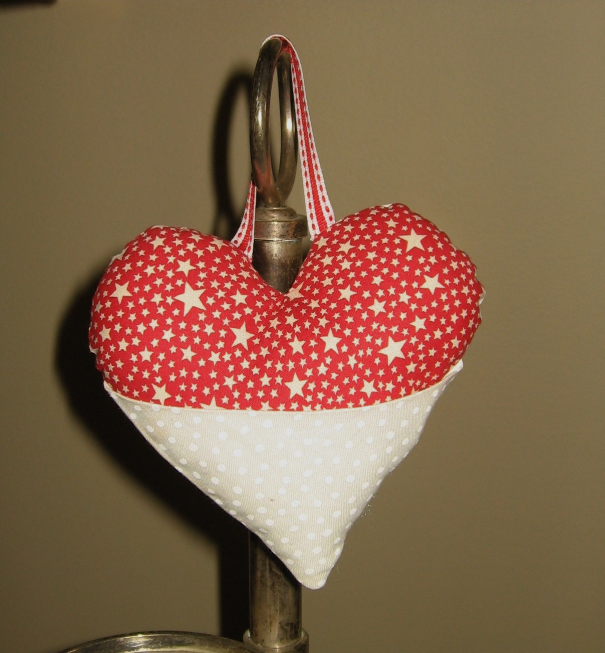 Looking for a quick gift or a fun home dec idea? 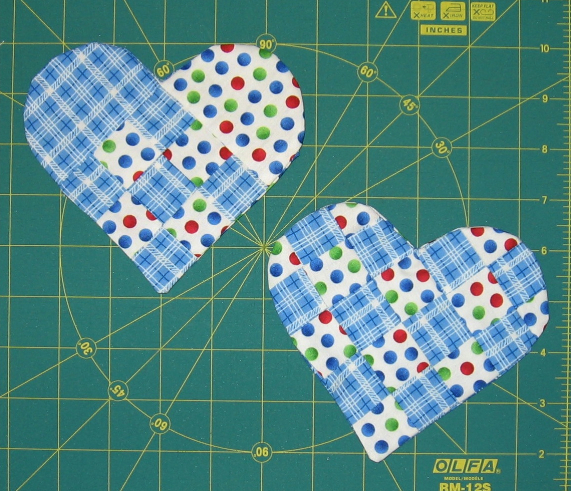 Here’s a set of Pretty Patchwork Heart Pockets that can be sewn together in about an hour. This tutorial includes directions for making both versions! Make a bunch of these and place in a pretty basket or bowl. Use clothespins to attach them to ribbon and create a fun garland or window swag! 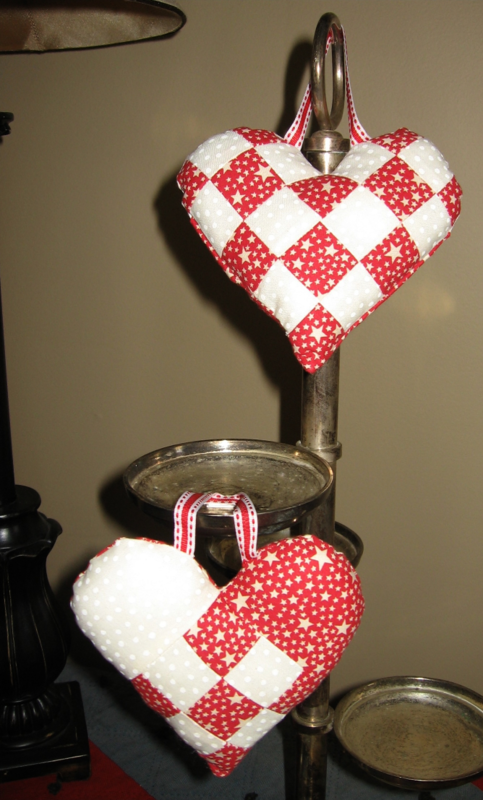 You can use scraps for this and make them in a variety of colors – red and white for Valentine’s Day, green and white for St. Patrick’s Day, red/white/blue for Fourth of July, orange and black for Halloween, or red and green for Christmas! The back features a small pocket. Tuck in a gift card or some dried flowers. 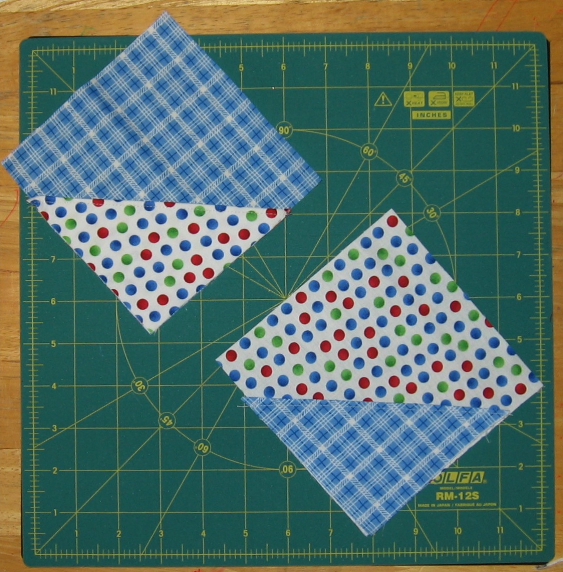 Take one Fabric A 4.5″ square and one Fabric B 4.5″ square. 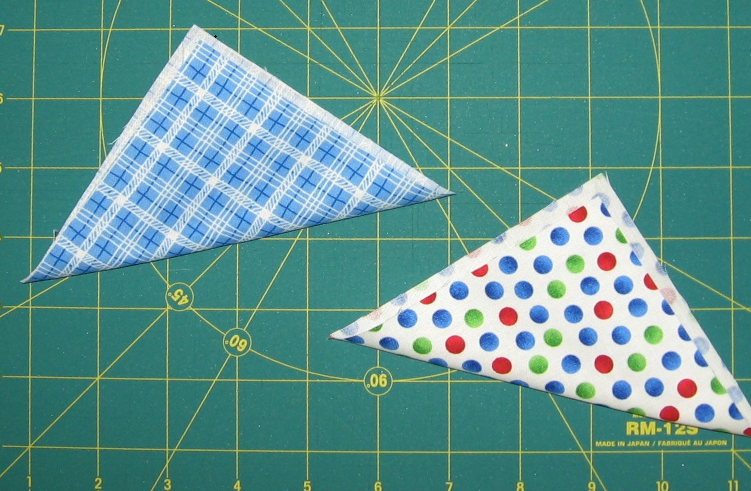 Pin the squares right sides together and sew a 1/4″ seam on the right and left sides. Make two sets (Figure 1). Cut these units into three rectangles that are 1.5″ x 4.5″. Make sure you are cutting parallel to the seams you just made (Figure 2). Do this for both sets. 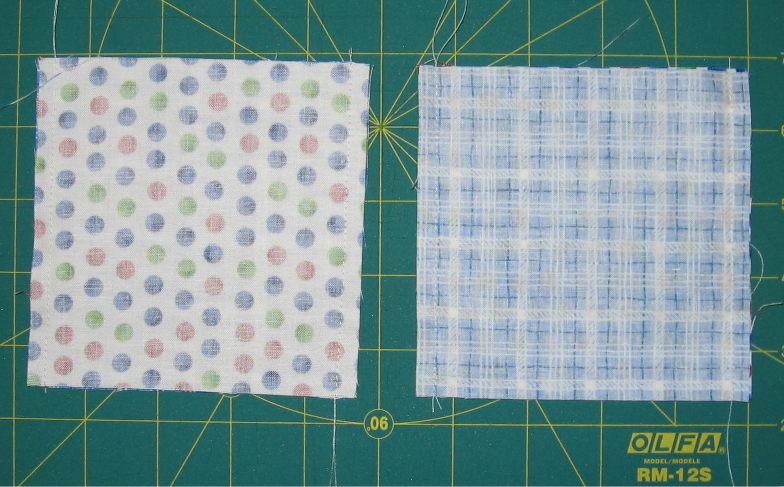 Press the seams towards the darkest fabric to create two pieced units (Figure 3). 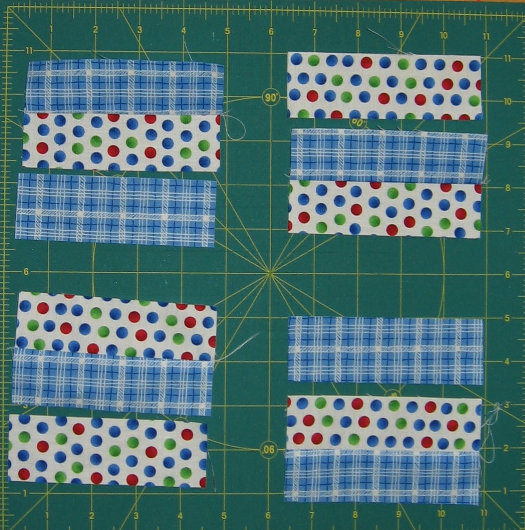 Take the center rectangles and sew them to the appropriate side of the pieced units (Figure 4). Press the seams to the darks. You now have two units of alternating fabrics (A-B-A and B-A-B). Make two sets. Take one of each type of square (A-B-A and B-A-B), make sure stripes are going the same direction, and pin them right sides together. Sew along the shorter sides with a 1/4″ seam. Do this for both sets. 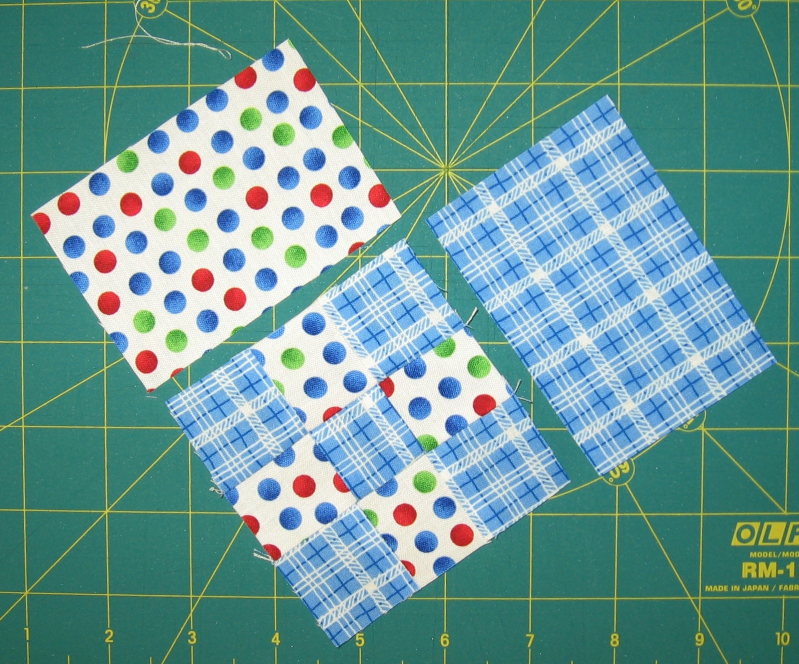 Cut each set into three rectangles that are 1.5″ x 4.5″. You will be cutting perpendicularly to the stripes (Figure 5). Press the seams. 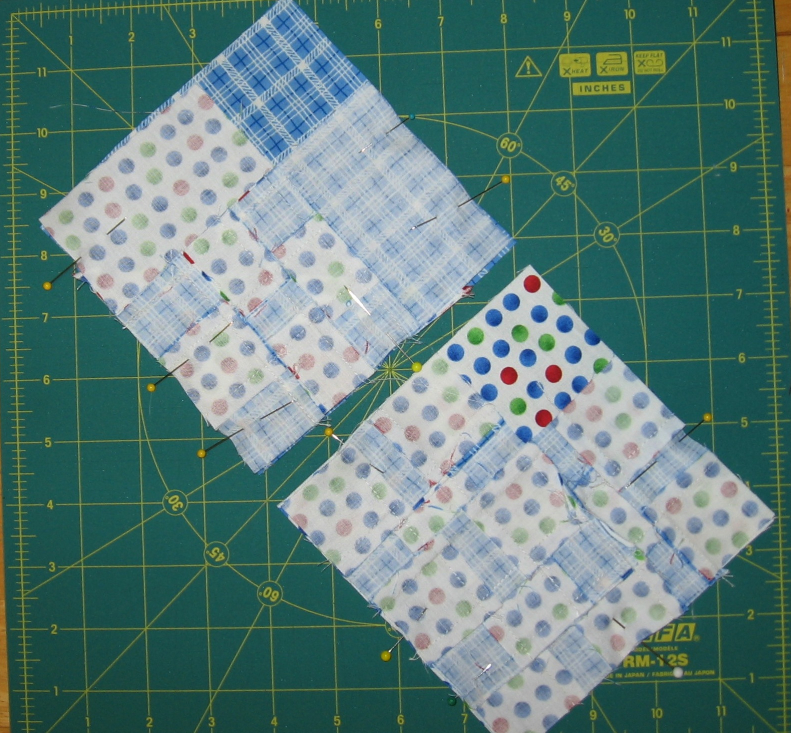 Sew the center strip to the appropriate pieced unit to make TWO nine-patch blocks (Figure 6). 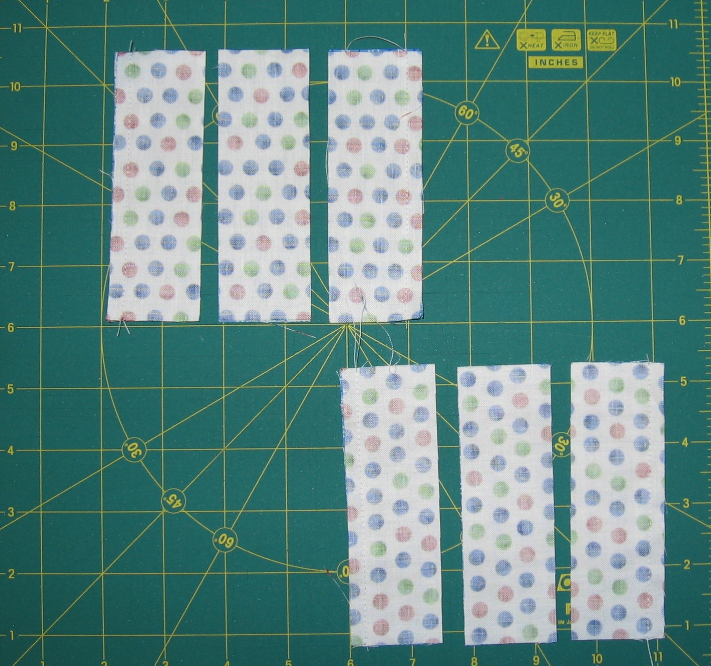 Do not sew the other strips to make blocks. You will now two nine-patch blocks and two sets of partial blocks. 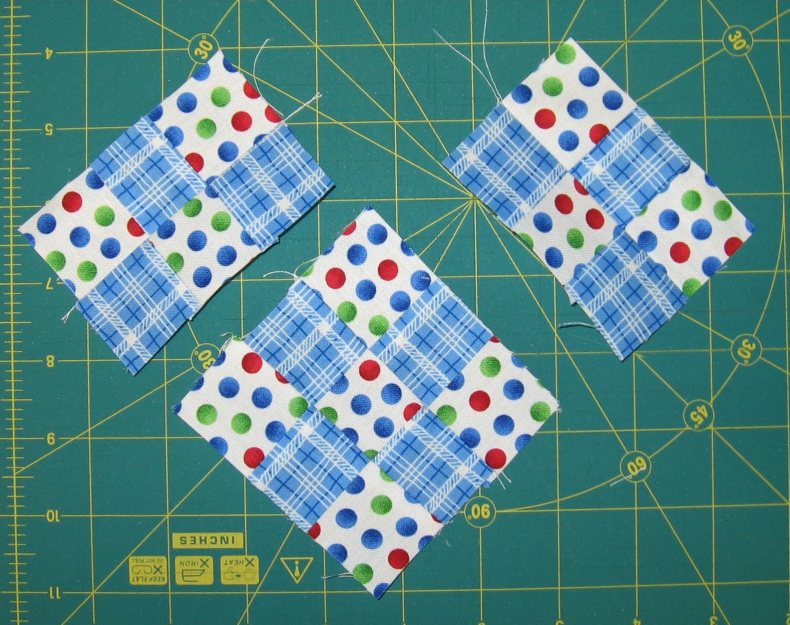 To make Version 1, sew the partial blocks onto one nine patch block (Figure 7). 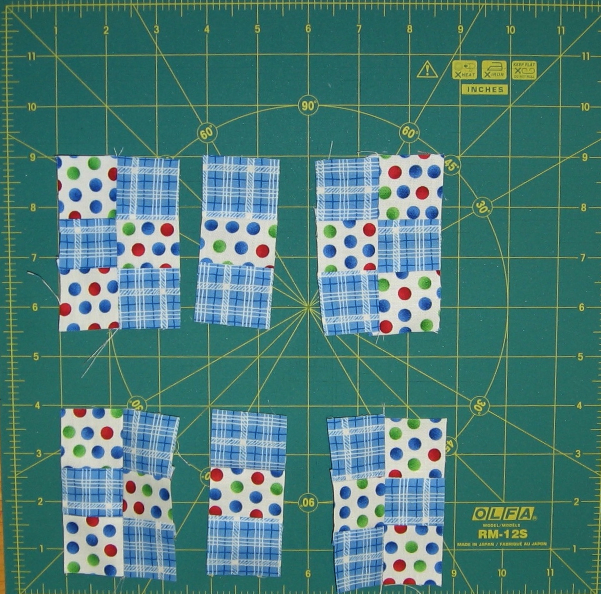 Take make Version 2, sew the 3.5″ x 2.5″ rectangles onto one nine patch block (Figure 8). 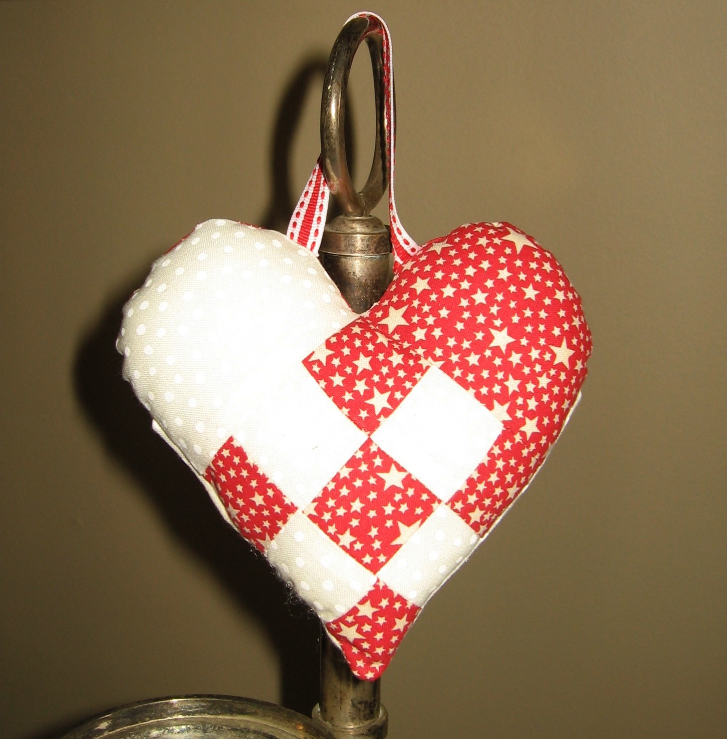 Set these two heart fronts aside and make the pocket. 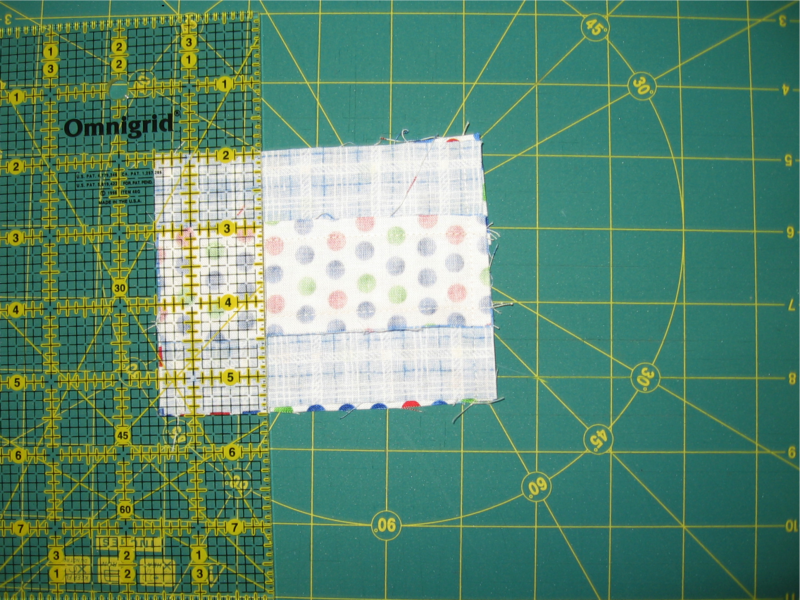 Take the remaining two of the 4.5″ squares, and press it on the diagonal right sides OUT (Figure 9). Take one of the 5.5″ squares, place it right side up, and then pin one of the folded triangles on this to make the pocket. For best results, use contrasting pocket on the backing fabric (Figure 10). Pin one heart front and one heart back right sides together (Figure 11). Download Heart Template here. Trace onto piece of cardboard and cut out template. 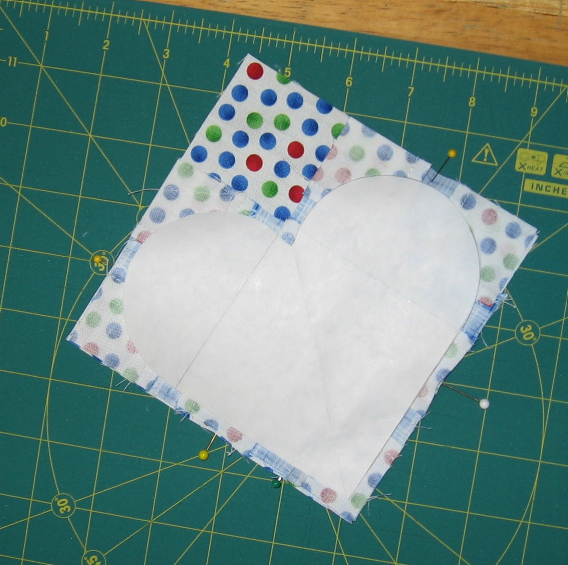 In order to create sewing line, place template on pinned hearts and trace around it (Figure 12). DO NOT CUT. 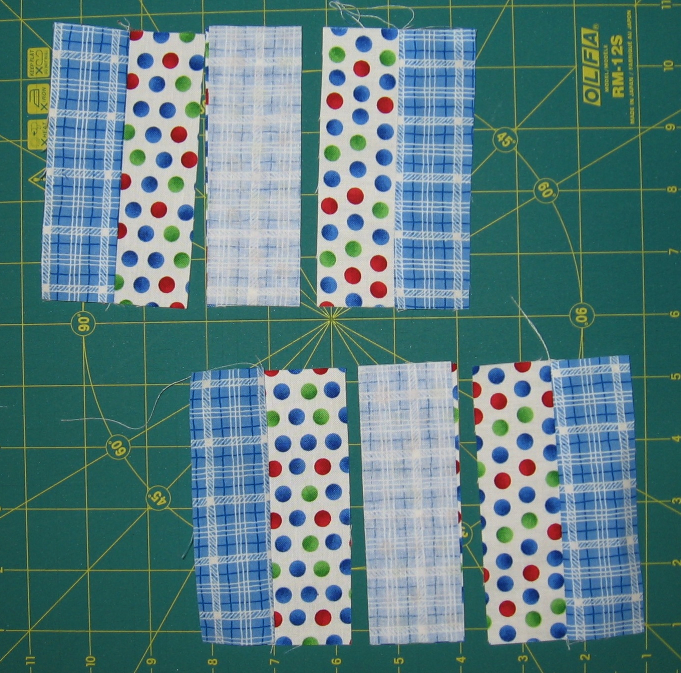 Sew around the line you just drew – leave a 3″ opening in one side for stuffing. Cut off excess fabric and leave about 1/4″ seam. Clip corner, curves, and heart center. Turn inside out (Figure 13). Stuff lightly and hand-stitch opening closed. Only 17 more craft days until Christmas! Not much time left to get those handmade gifts completed for your friends and loved ones. This year I also need to think about Teacher Gifts – I need 11 of them! I was planning to make each teacher one of these little stockings and put a gift card and some candy inside, but it’s time for me to admit that I need to go to plan B. 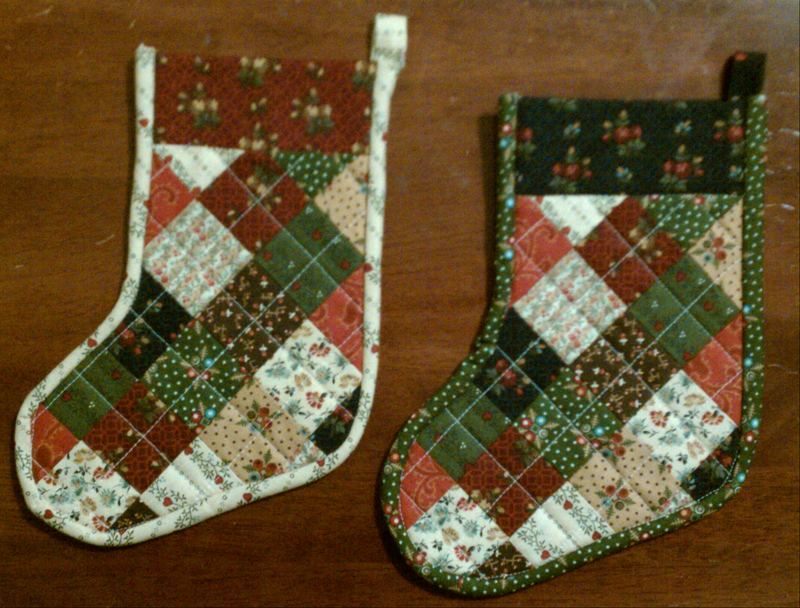 Right now I have 4 stockings and I won’t have time to make the other 7 before my son starts vacation. No worries though, I do have a back up plan, but it involves buying it from the store (gasp!). 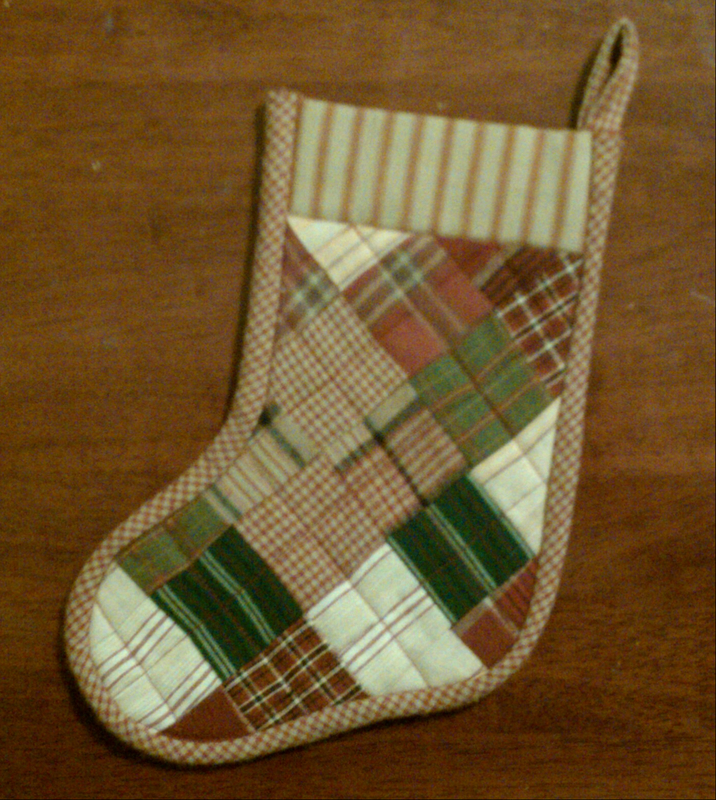 However, I did want to share this stocking with you as I think they make very cute gifts and can also be hung on the tree. 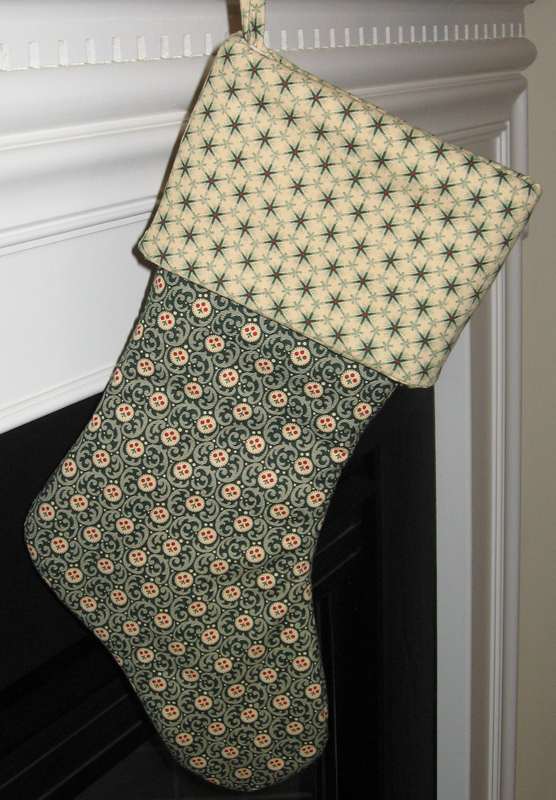 These stockings are great stash-busters and best of all, the pattern is free. If you need a larger stocking, you can download this free pattern from the McCall’s website (but you have to join their mailing list first). I made a few of these last year and they are also cute. This pattern is nice because it is simple and you can get creative with the embellishments. I am already thinking about Keep It Thimble’s plans for next year and hope to have some new features to roll out next year. More on this in a few weeks. 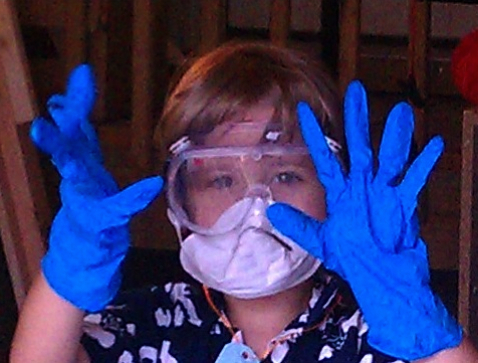 Today, he took a big step towards this lofty goal – starting Kindergarten! He wanted to bring an apple to his new teacher (where do kids get these ideas – TV? ), so I figured a stuffed one is the way to go. Basically (for sewing purposes), an apple looks like a tomato expect that it is taller. I made up a template that looked like an oval that came to a point at each end. The size was about 2″ x 5″. I cut out five (5) of these ovals from quilter’s cotton (although you could also use wool), sewed them together, and left one side open for turning. Turn the piece inside out, stuff, and then hand sew opening closed. Get a small button for the bottom of the apple. Next, take an upholstery needle and thread with strong twine (I used linen thread). Poke the needle down into the center of top and come out through one of the button holes on the bottom. Poke the needle back into another button hole, come out through the top, and then pull tight. Do this 2 more time so that you can create a nice dimple in the top and bottom of the apple. Don’t cut the thread. 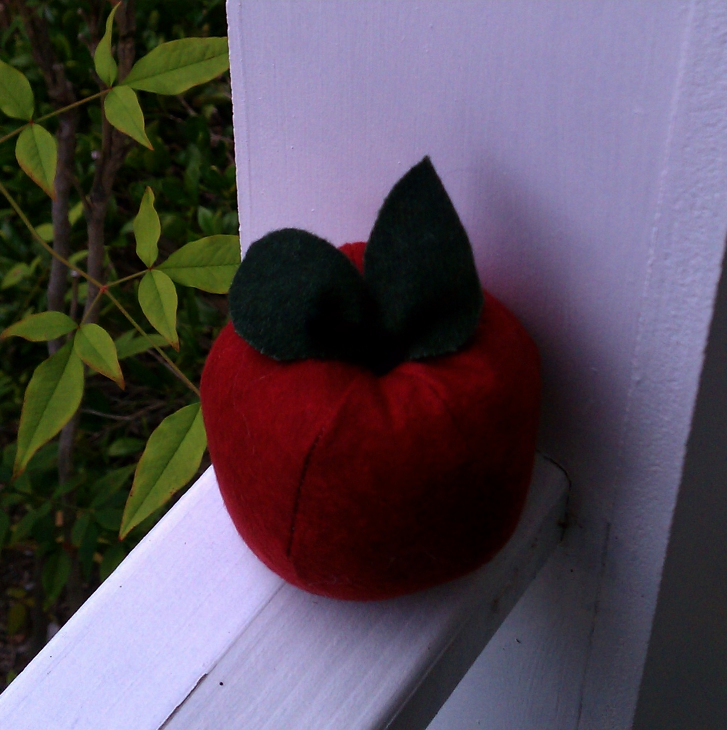 Next, cut out two leaves from felt and sew to the top of the apple. You can use the same thread you used for making the dimples. Tie off thread and cut off excess. Get a black pipe cleaner and cut it about 3″ long. Near the base of the leaves, poke a very small hole with scissors and insert the stem. You can use a dab of glue to hold into place. Voila – an apple for the teacher that will never spoil. Happy Easter everyone! 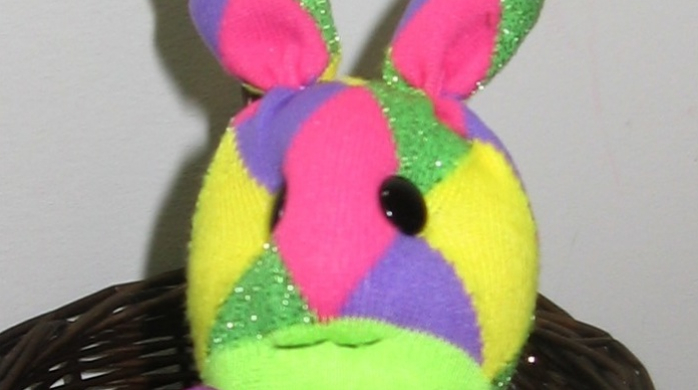 This tutorial might be a bit late, since you can’t make these for an Easter Basket, but I really wanted to post this cute little rabbit I made from some socks bought at Target for a dollar! 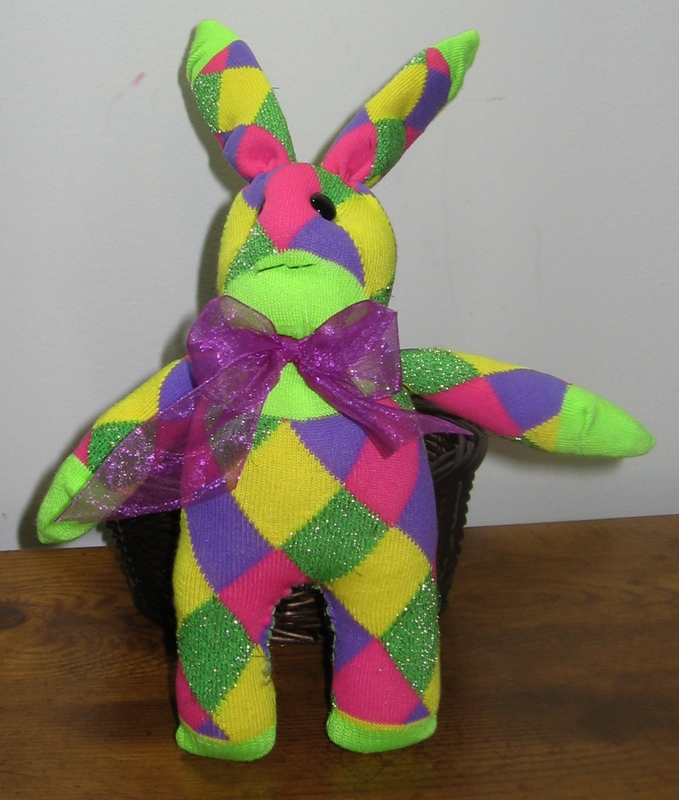 My plan was to make up my own directions, but I figured someone had already done something like this and a quick Google search turned up a free sock rabbit pattern at Clubhouseb.com. 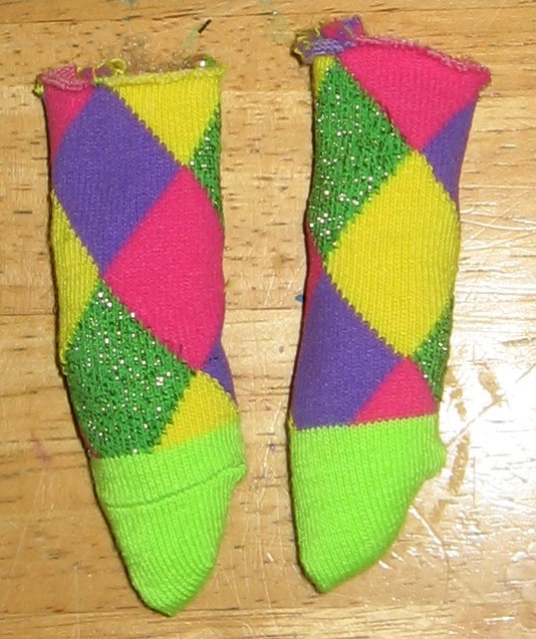 Download the pattern and cut out the sock pieces per the directions listed. This tutorial assumes you have the pattern handy for reference. As you can imagine, you start with a plain sock. Turn the sock inside out and arrange the heel so that it is facing you. 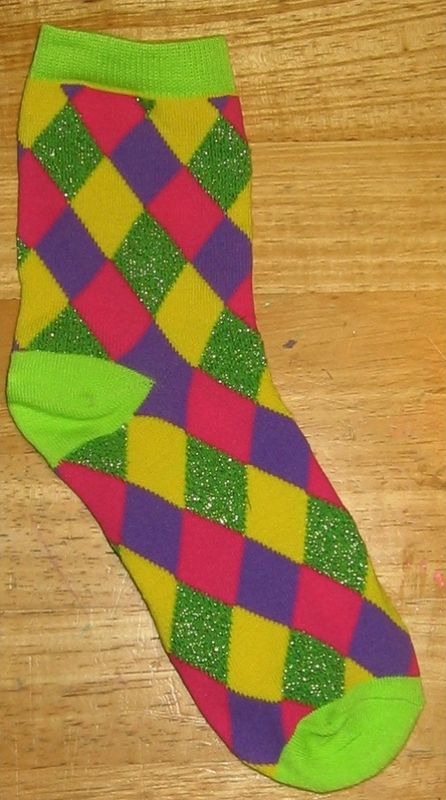 Following the directions on the downloaded pattern, draw lines on the socks for the ears and legs. Stitch around the lines (per the pattern) and cut the ears and legs apart. Turn the whole thing inside out (there will be a opening in the crotch for this). Use a point turner to poke out the tips of the ears and the corners of the feet. Stuff with fiberfill. 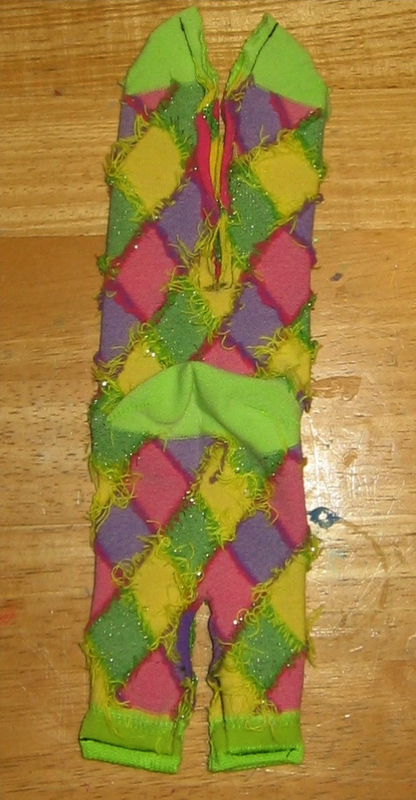 The socks I used were children’s size, so the rabbit will be about 7″ high (the ears add about 4″ more height). Be careful when stuffing – you don’t want to overstuff and you don’t want the sock to run near the raw edges between the legs. Whipstitch the opening shut with matching thread. Next, make a running stitch around the base of each ear, pull to gather, and tie off (the pattern indicates doing the running stitch across the ear, but I did it around in order to make it easier to gather and tie off). Figure out where the neck is going to be and make a running stitch around the neck, pull to gather, and tie off. For the face, take two buttons with shanks and sew on according to the directions. If you try to use buttons with holes you will find that the eye indentations will not look correct. Rabbit eyes are positioned more to the side instead of the front, so using the shank buttons makes the indentations appear on the sides of the face, instead of the front. Create the mouth and nose per the directions. I didn’t statin stitch a nose since the pink diamond from the argyle pattern is positions perfectly for a nose – what a happy accident! Take the other sock and create two arms. For my arms, I cut off the toe of the sock and stitched down the middle (like I did with the ears) so that the arms would be pointed on the end like paws. Stuff the arms lightly and whipstitch them into place at the neck. 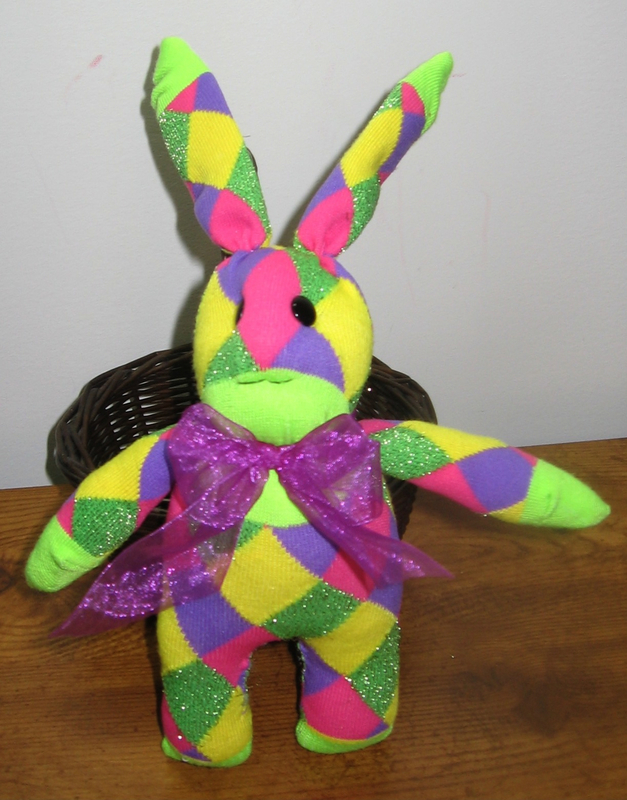 Tie a bow around the neck to complete the look and you have an Easter Bunny! If you have the inclination, you can also embellish him (or her) further by adding a hat, shirt, dress, basket, etc. If you want to get really fancy you can sew a running stitch at the wrists and ankles to make the paws more defined. My son is at that age where he gets invited to lots of birthday parties, so I am always on the look-out for fun little things to make for party favors and little gifts. 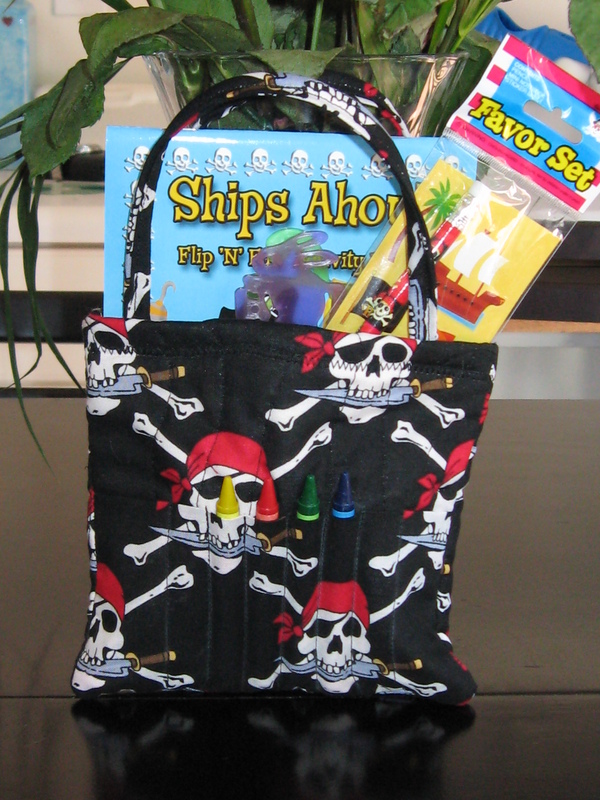 This first favor is one I made for my son’s Pirate themed party. The pattern is the Child’s Coloring Bag from Clothesline Quilts. What’s great about these bags is they don’t take up a lot of fabric and you can easily make 8 in about 90 minutes (which includes the time to quilt the fabric). Next, go to the Dollar Tree and pick out some crayons and other little things to go inside! 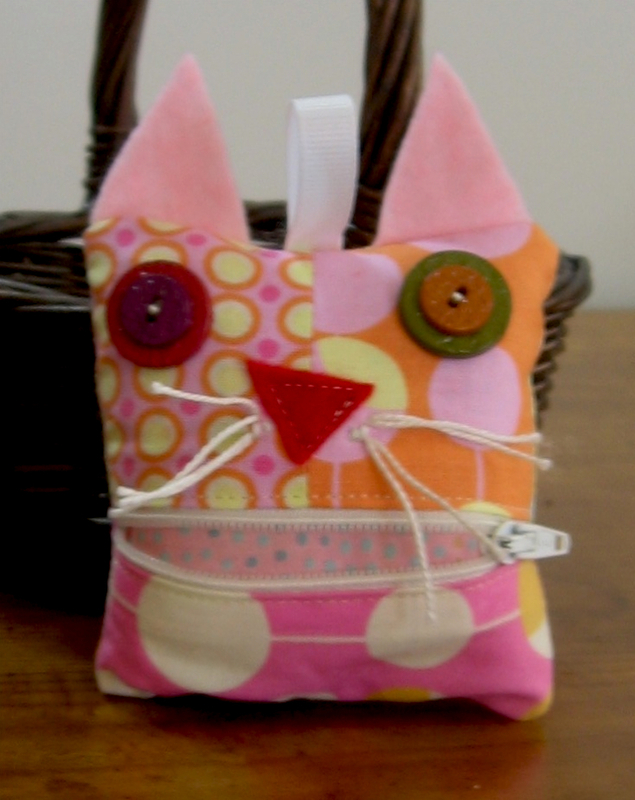 The next favor is a Zipper Critter by Indygo Junction. The pattern comes with three different sizes and three different types of of animals (dog, cat, pig). It’s great for using up scraps and any old zippers you have laying aroud. What’s nice is that you can personalize the fabric choice for each child, or do it all based around a theme. These critters also make nice package decorations – especially the smaller one that is attached to a lanyard. One of these takes about 30 minutes to make (although you can speed things up if you want to make several by cutting them all out at once and sewing them assembly line style). Hope everyone is having a wonderful Christmas! 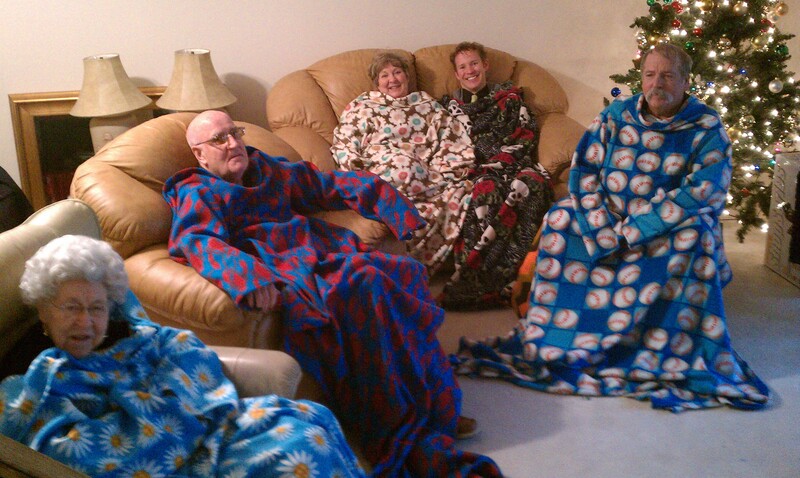 Now that the gifts are all given, I can reveal what I made for gifts this year – Snuggies!! Each person received a handmade Snuggie (aka Slanket aka Blanket with Sleeves (the boring name)) in a fabric of my choice, with each fabric print specially selected to complement the recipient’s tastes. Everyone graciously agreed to have this picture taken and posted on my blog. Thanks everyone – this will be my most popular post yet! Have a wonderful holiday! See you next year :). My friend wanted to make some little peace doves to give as gifts this year, and asked me to help her since she knows I love to sew! 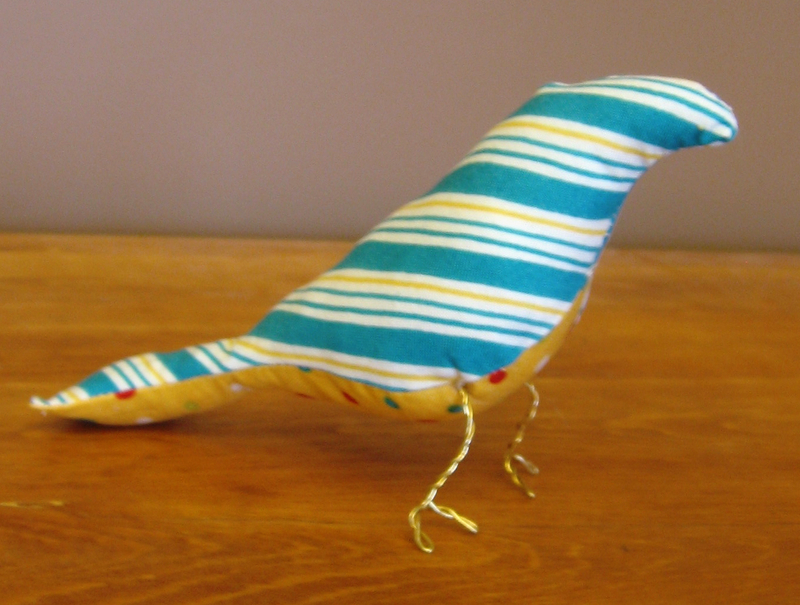 She emailed me a few pictures of some stuff birds she liked, and I was able to find a great FREE pattern at Spool Sewing for these birds (the free pattern is available for download in the right hand sidebar). I stitched together a quick prototype on my sewing machine so we had a better idea of the finished product. It took no time at all and you could easily create a dozen of these in an evening. You can embroider little eyes using french knots, or you can attach a beads (be sure to do all these embellishments before stitching and stuffing it). Another idea is to embroider designs on the body, or create little wings in a contrasting color and sewing them on. I don’t have a picture of my friend’s, but she used white felt for all her pieces, and then hand sewed them together with a blanket stitch (in white). 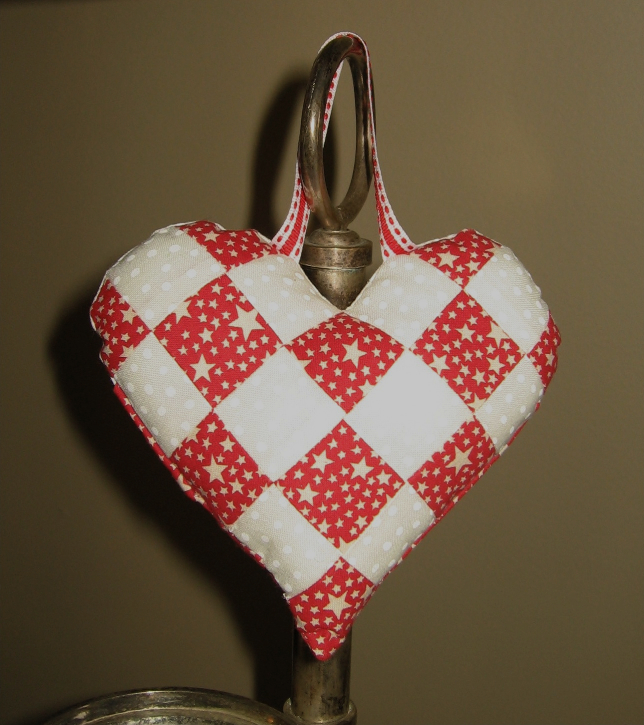 It would have also been cute to sew around in contrasting color like red or blue. I plan to make some of these as well, but wanted to get this posted in so you can get the pattern and start making some yourself. We used the pattern as is, and then used copper jewelry wire to make little feet. I pocked a hole in the bird body with a little awl, stuck in a dab of hot glue, then pushed the feet inside. Since the birds are pretty light, they stand up pretty well on the feet. You can adjust the feet after you get them glued in. 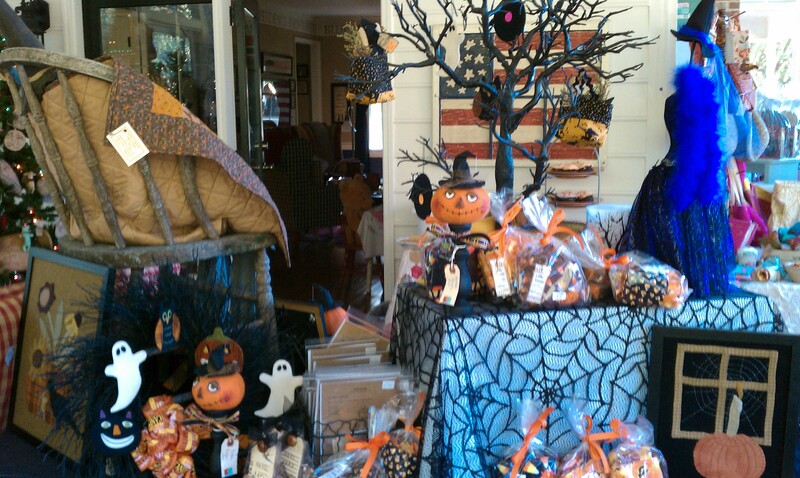 First, a big thank you to Sharon of Liberty Rose for hosting the first annual Fall Porch sale at her house. I can’t even tell you how much work Sharon and Evette did to get everything arranged and set-up for Saturday. Everything was perfect, down to the last detail!! I am very honored that Sharon asked me to be a part of this show and I look forward to doing it again next year (yes, we are already planning another one!). This is what Sharon’s back porch looked like before the sale. All the tables are loaded down with goodies and the tree is full of ornaments. By the end of the day, everything was bare (I wish I had some after pictures). Ladies started lining up well before 10am, eager to look at all the beautiful items that were for sale. 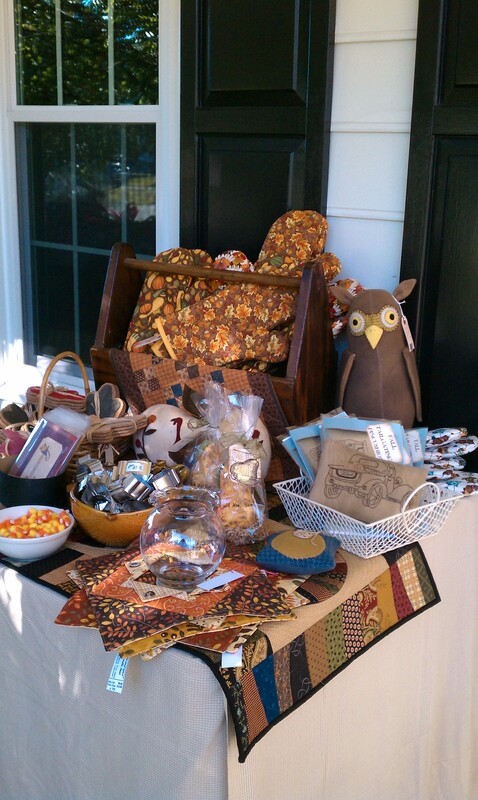 This display features a wool Hootie owl I made and some pot holders and candle mats made by Laura. 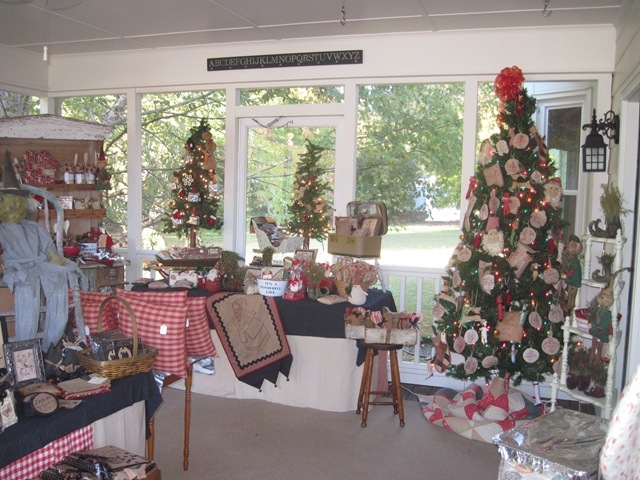 Here is the main corner where my wares were displayed. 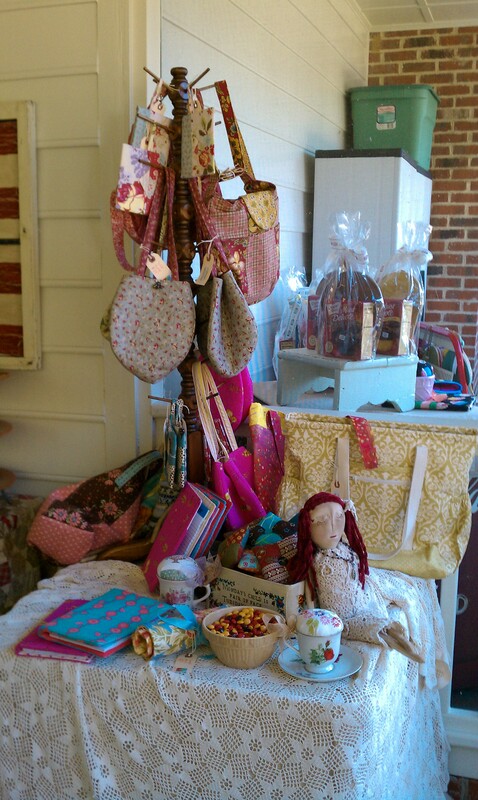 The stand is my grandmother’s spool tree – it’s perfect for hanging purses and other small things. The doll was made by Jennifer :). Here is the Halloween corner. You can see Bartleby the Pumpkin with his sly grin, hanging out with the other witches and ghosts. Evette had some beautiful wool Halloween ornaments, Jennifer made some witches boots, and Sharon had a cute little embroidered witch. Thank you to all the ladies (and gentlemen – I saw at least two) who came to the sale. It was wonderful meeting everyone and I look forward to seeing you all again next year! 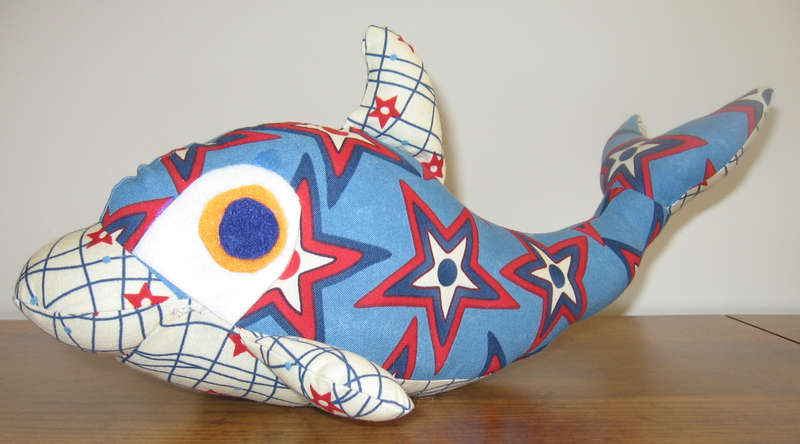 After I finished making the sea creatures for my son, I saw this cute little Dolphin pattern by Melly and Me. I ordered it online (but it is also featured in a recent issue of the Australian Homespun magazine (issue #79)). I was able to get it cut out and sewn together in less than 2 hours. I used some left over Fourth of July fabric since my son’s favorite color is blue and his favorite shape is stars. I introduced this as Dee Dee Dolphin, but my son re-named her “Big Mama Whale” since she takes care of his other sea creatures. Too cute! This is a folded patchwork star that is easy to make. These make great Christmas gifts and it’s a great way to use up some of your stash (to make room for new fabric). My grandmother showed me how to make these stars when I was little – I can still remember carefully looking through all the fabrics in her stash to pick the fabrics for the star I made. Once the star was completed, we got an old round cheese box, covered it in fabric, and sewed the star on top! The pattern is available for purchase in my shop. It contains step by step directions for creating the Folded Star, with photos showing the key steps. It has finishing instructions for both a fabric covered box and a table topper.